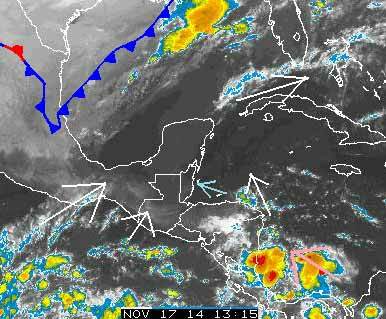 Belize NMS: Mainly fair weather today and then moisture increases tonight as a cold front approaches the country. 24-hour forecast: Mostly sunny today with very little rainfall across the country, except inland where there is the chance of an isolated afternoon thunderstorm developing. Cloudy at times tonight with a few showers and isolated thunderstorms mainly along the coast. Today: Winds:E-SE 5-15 kt. ; seas: Choppy. ; waves: 3-4 ft.; mainly fair. Tomorrow: Winds: N-NW (becoming N-NE after midday) 10-20 kt with higher gusts. ; seas: Moderate-rough. ; waves: 3-7 ft.; some showers, a few thunderstorms and periods of rain. Marine Outlook: Tuesday night:- Winds: N-NW 15-25 kt. ; seas: Rough. ; waves: 5-7 ft.; some showers, a few thunderstorms and periods of rain. General Outlook: For Tuesday and Tuesday night is for cloudy to overcast skies with some showers, a few thunderstorms and periods of rain over most areas, but especially along the coast and in the south. On Ambergris Caye this morning the wind has picked up a little, from the Southeast at 10 mph. Our expected high is 87. Widespread Fog this morning, which indicates that there was very little cloud around last night.. .. .This will burn off as the sun get higher, to give largely sunny, cloud free conditions.. . . . . That pool of near stationary weather sitting in the Caribbean, that suddenly moved our way yesterday, then veered off to the north, looks as if it was pushed that way by southerly weather in the Pacific and near Panama, pushing up our way, brining moist air.. . . . . .As that moist air cools, it could result in rain. . . . . But unlikely for that to happen whilst the day is warming up, but it could later in the day or evening. . . .There is also another cold front appearing. . Now effecting almost across the Gulf and will be effecting the Yucatan this afternoon.. ..Not sure yet, now near it will get to Belize. . .. .But if cool air pushes in under the warm wet air from the south, then that could certainly cause some rain. I am expecting generally sunny conditions this morning, with cloud increasing later in the day... .There could even be isolated rain late this afternoon or over night. 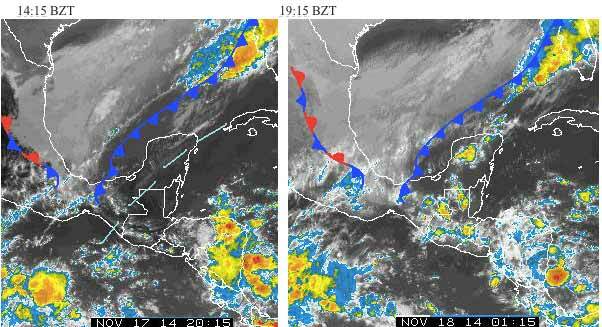 That cold front is almost on Belize. . . . .You can see in these two pictures how the leading edge of the cold air is crossing over the Yucatan by 14:15 BZT and 5 hours later, has caused the upper, warmer air to turn to cloud, some high. 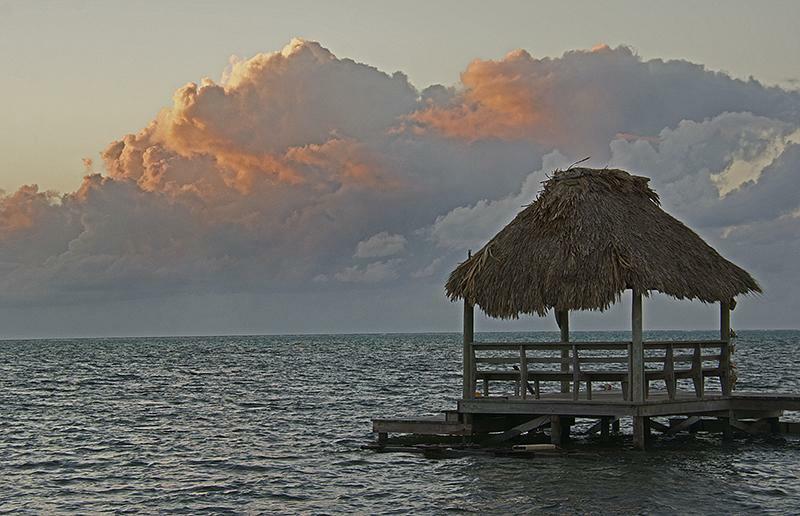 . . . . .This cloud I expect will cover over Belize over night, could even bring some rain. ..Probably cooler and cloudier on Tuesday than it was on Monday, and the possibility of isolated Rain.